1. A and B started a business with an investment of Rs. 36000 and Rs. 54000 respectively. After 4 month, C joined with Rs. 48000. If the difference between C’s share and A’s share in the annual profit is Rs. 8000, then find the 85 % of total annual profit? 2. A 200 m long train crosses another 150 m long train in 10 sec, running in opposite direction. If the speed of the first train is 60 km/hr, then find the speed of the second train (in km/hr)? 3. The difference between Simple interest and Compound interest on a certain sum at the rate of 15% per annum for two years is Rs. 3600. Find the simple interest on that sum at the rate of 8% per annum after 6 years? 4. A shopkeeper sold a table at 20 % discount on marked price and he gains 25%. If the marked price of the table is Rs. 6000, then find the cost price? 5. A certain number of men can complete a piece of work in 60 days. If there were 12 men more, the work could be finished in 10 days less. How many men were originally there? Directions (Q. 6 – 10) Study the following information carefully and answer the given questions. The following bar graph shows the sales turnover (In lakhs) of various laptops in 5 different months in a certain year in a state. 6. 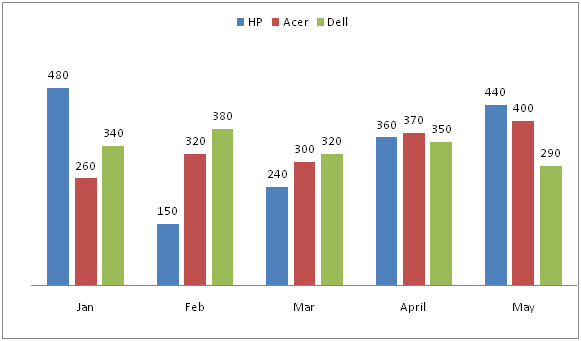 Total sales turnover of Acer laptop in the month of Jan and May together is approximately what percentage of total sales turnover of Dell laptop in the month of Feb and Apr together? 7. Find the difference between the total sales turnover in the month of Feb to that of May of all the given laptops together? 8. Find the ratio between the total sales turnover of HP laptop in the month of Jan and Mar together to that of total sales turnover of Dell laptop in the month of Mar and May together? 9. Find the average sales turnover of HP laptop in all the given months together? 10. Total sales turnover in the month of Jan is what percentage of the total sales turnover in the month of April? 1) A and B started a business with an investment of Rs. 36000 and Rs. 54000 respectively. After 4 month, C joined with Rs. 48000. If the difference between C’s share and A’s share in the annual profit is Rs. 8000, then find the 85 % of total annual profit? 2) A 200 m long train crosses another 150 m long train in 10 sec, running in opposite direction. If the speed of the first train is 60 km/hr, then find the speed of the second train (in km/hr)? 3) The difference between Simple interest and Compound interest on a certain sum at the rate of 15% per annum for two years is Rs. 3600. Find the simple interest on that sum at the rate of 8% per annum after 6 years? 4) A shopkeeper sold a table at 20 % discount on marked price and he gains 25%. If the marked price of the table is Rs. 6000, then find the cost price? 5) A certain number of men can complete a piece of work in 60 days. If there were 12 men more, the work could be finished in 10 days less. How many men were originally there? The following bar graph shows the sales turnover (In lakhs) of various laptops in 5 different months in a certain year in a state. 6) Total sales turnover of Acer laptop in the month of Jan and May together is approximately what percentage of total sales turnover of Dell laptop in the month of Feb and Apr together? 7) Find the difference between the total sales turnover in the month of Feb to that of May of all the given laptops together? 8) Find the ratio between the total sales turnover of HP laptop in the month of Jan and Mar together to that of total sales turnover of Dell laptop in the month of Mar and May together? 9) Find the average sales turnover of HP laptop in all the given months together? 10) Total sales turnover in the month of Jan is what percentage of the total sales turnover in the month of April?